Ragweed is a prominent cause of seasonal allergies. Thus far, information on IgE-binding sites of major allergen in ragweed pollen, Amb a 1, is very limited. A powerful experimental method to gain insights on the allergen epitopes is the selection of peptides from biological libraries that bind to anti-allergen antibodies. In this work, we aimed to map IgE epitopes of Amb a 1 using epitope-mimicking short peptides – mimotopes that were affinity-selected from phage-displayed random peptide libraries. The peptides weakly aligned with the Amb a 1 primary sequence, thus suggesting that the epitopes are conformational. 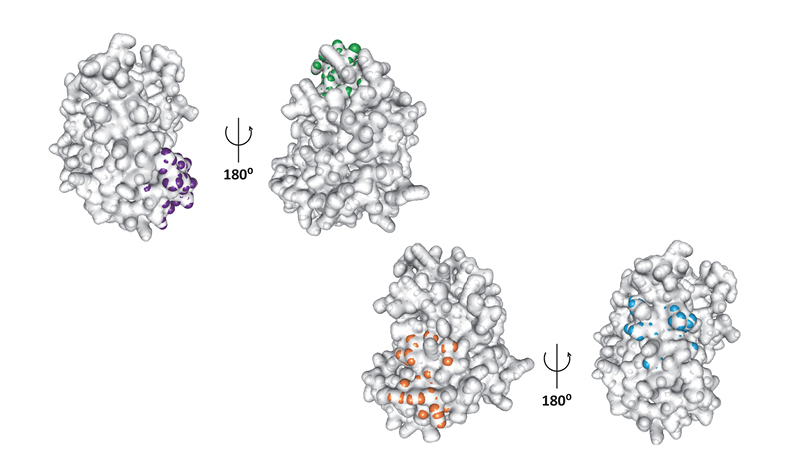 When the peptides were mapped onto the surface of Amb a 1 homology model, the EpiSearch analysis predicted the location of four potential epitopic sites on surface patches centred at residues K104, S110, H214, and W312. The peptides matching to the predicted epitopes bound selectively to the IgE from pool of ragweed-allergic patients’ sera and therefore represent mimetics of Amb a 1 IgE epitopes. The knowledge of IgE epitopes is a prerequisite for the rational design of molecular-based approaches to diagnosis and immunotherapy of allergic diseases.